» When I was a little girl, my stepfather coached a boys baseball team, and sometimes the boys would come by the house with a ball and bat. They taught me how to throw and catch. When my stepfather started a girls softball team, I became the youngest member of the team. That’s what started me in sports. » A good teacher gives inspiration. » My main sport was always basketball. Not track. I started playing basketball at Middleton High School in Tampa. The basketball court was outside. We didn’t have lights. At night, the neighbors would set up lamps with long extension cords and flood the court with light so we could practice. » I was someone who didn’t talk a lot. I’m just a quiet person. » The most important thing I’ve learned in life is to be truthful to yourself and be truthful to others. » You have to always keep your body in shape. » We went to a store when I was a teenager and there were two water fountains, one white and one colored, and I wanted to taste the water from the white one to see if it tasted the same. It did. » When people boast about themselves, I think they should leave the boasting to someone else — and not do it themselves. » At Tuskegee, we were undefeated in track when I was there. We were undefeated in basketball. We would always win. When I was a coach, I’d tell the girls that when I played, we’d never lose a game, and that we’re not going to lose a game now. That’s how I motivated them. » One of the most important things is to have a job. » I was the first black woman from Florida to compete in the Olympics. I was the first black woman to compete in the javelin. I also competed in the 80-meter hurdles, and I ran the third leg in the 440-yard team relay. I was happy to be there, representing my country, but I was also very hurt that I didn’t win. I knew I was also representing black people. I wanted to show everyone who thought that I couldn’t do it that I really could do it. » My stepfather was a porter on a train. He couldn’t read or write. The color of the tickets would tell him what city the person would get off at. I taught him how to sign his name. » I never was a good cook. » It’s been a while, but I like shopping and going to the mall. » I really didn’t know if I was a good teacher at the time, but when students graduated and came back to see me and told me that I helped them, that’s when I knew. » Jumping over those wooden hurdles for years, my drag leg would hit the hurdle, and that hurt my knee. That’s why I’m in a wheelchair now. I’ve had a knee replacement. I have pain. It hurts me not being able to get up and walk. » I wouldn’t have gone as far as I did without athletic talent, but I still did a lot of practicing. I had to work very hard. » There was segregation back then. To ride a streetcar, you had to get in the back. For them to say you can’t do this or you can do that, that made me feel pretty bad. But when I competed in sports, that was a good feeling. I felt like the best girl out there. 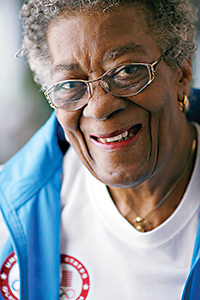 » Competing in the Olympics in 1948 may have paved the way for other blacks. I was very proud to do it. » I was engaged once, but my mother was ill, so I told him that I’d have to wait before I could get married. I had to make a choice, but I couldn’t leave my mother, so I never did get married. I devoted my time to my students, but I would have loved one or two children of my own. » My advice? Be a winner. Not a loser.